Pro-Line and Sports Interaction are both online betting sites where you can place bets on sports. The real question is which one is better? Surprisingly players are still playing at Pro-line and it’s not even close to being as good as an online sportsbook like Sports Interaction. Sport Select is the company behind Pro-Line and they have different branding throughout Canada. They are known as Pro-Line in Ontario and Atlantic Canada, Mise-O-Jeu in Quebec and Sports Action in British Columbia and sometimes referred to as Oddset. Checking a MLB baseball game between Baltimore Orioles and the Tampa Bay Rays on Wed July 26th, 2017 we get some discrepancies in payouts. First of all, Pro-Line pays out less on the over/under but wait! It gets worse, Pro-Line don’t even tell you what the over/under amount is and you have to click to add to your betting slip to only realize it’s over/under by 9.5 which is a half run more than Sports Interaction. If you ask any sharp sports bettor they’ll tell you this will cost you. You’re getting nearly 50% more payout on Sports Interaction AND you don’t have to mess this up into a 6 bet parlay which is only going to compound the odds against you. 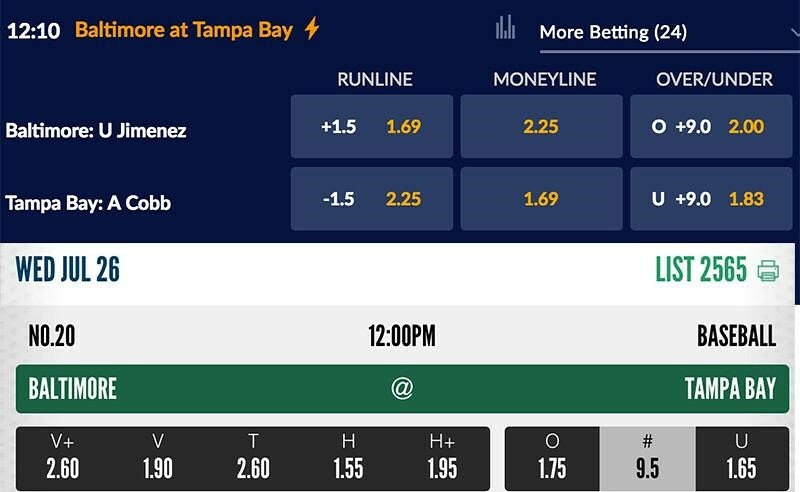 If you ask players that regularly bet on sports, they’ll tell you they like sites where they can bet on anything they want like the coin toss in soccer, first team to score, half time results and prop bets too. If ThePOGG.com were to rate Pro-Line as a sportsbook they would get low markets for selection of betting markets and having the worst odds found online. From the Wikipedia entry on Sport Select. In recent years, Sport Select has come under increasingly heavy criticism from Canadian gamblers due to the poor odds it offers (from the gambler's perspective). A private bookmaker licensed in the United Kingdom or Nevada generally maintains an overround (or "vig") of about 110%, meaning the bookmaker can expect to pay out $100 for every $110 that is wagered. In Canada, however, the overround for an individual match in Sport Select odds often exceeds 130%. To make matters worse for the bettor, the parlay requirement compounds the overround - the actual vigorish is a minimum of 160% but can climb to well over 300% (if six selections are made). In jurisdictions such as the United Kingdom where genuine compeititon is allowed, bookies often pay bonuses for winning parlay bets to help offset the compounded vig. Sport Select does not. Apparently it’s against the law to allow betting on a single sporting event but for some stupid reason it’s ok when it’s combined into a 6 game parlay. This makes no sense and at least explains why Pro-Line has their rules. Since they own a virtual monopoly in Canada, they are able to give out the worst payouts and it really gives players a bigger incentive to find other online sportsbooks that do accept Canadian players. You’d think that players are betting so much on sports and all this revenue is generating taxes so why not make it a bit fair for players? Just checking the hashtag of #proline isn’t good enough, you need to go further to find what players really think about Pro-Line and their true emotion shine through, might contain some NSFW language. Leave a comment and tell us what you think about Pro-Line.